Create polished, professional galleries with the options in your Media Manager, no matter your theme. Here’s a quick look at different gallery styles on three free personal blogging themes. Photographs capture moments and bring life and color to our blogs, websites, and portfolios. In this age of digital storytelling, images are key elements in our narratives. With over 200 themes in the WordPress.com Theme Showcase, some designed for photography, there are many ways for you to tell your stories. Photographers and photo bloggers can choose from a number of versatile premium themes to take their passion to the next level. But you don’t need a premium theme, or even a photoblogging theme, to display your images in polished, professional layouts. Let’s take a look at gorgeous image showcases on free themes that are great for personal blogging and writing, created with the built-in gallery options in your Media Manager. Set your gallery to one of these five options, which each have a distinct look. Do you prefer a clean grid of separate thumbnails, scattered on the page? Choose the Thumbnail Grid, your default gallery setting. Or, do you want a dynamic tiled look, with different-sized images placed within a mosaic? Select the Tiled Mosaic. One notable feature about Ryu is the large-sized font of the post titles — it’s a bold yet sophisticated typographic touch, and pairs great with galleries of any kind. A minimal theme, Circa has widget areas that are located behind a gear icon in the header, so your galleries take center stage on the page, no matter which type you select. …and click “Create Gallery,” where you can then drag images into your Media Manager. On this screen, in the dropdown menu next to “Type,” select the type of gallery you’d like to display (Thumbnail Grid, Tiled Mosaic, Square Tiles, Circles, or Slideshow). Each gallery has its own unique style — while you might have a favorite, we recommend trying them all before you publish a post. Need more information? Check out more themes in the Theme Showcase and learn more about galleries. Twenty-Twelve works good for this, although the editor has a bug when posting full screen images. I am waiting for more free grid themes coming up! I can’t deny it, the Gallery is my favorite WP feature. 🙂 Right now there’s a “petition” on in our Ideas forum to expand it’s functionality even further. Hope the core devs will consider it. I’ve been wondering how to do different galleries and didn’t know it could be selected from a dropdown. Thanks! Yes, it is true that one image is best for a thousand words and also one video is also best for a thousand images. Photoblogging explores many things in a simple way. Loved this! Thanks for sharing this, it was very helpful. I’m a big fan of the Fontfolio theme for my Paris photo blog. It’s a free grid theme that looks great! Brilliant! I’m going to try this – I’ve been doing it the hard way up to now. I LOVE using my photos with my posts! WordPress makes this so easy! thank you! A great article. I did this today on my blog for the first time. Thanks for the insight! I’ve committed to learning one new blogging feature per post. This is my “one new” for this month. THanks! I love the tiled mosaic! It gives everything a bold and professional look and I love how it’s all done for you! Love Ryu. Can’t wait to try! If you’ve spent any time on my site, you know that I seriously love the Gallery feature. It’s an elegant and easy way to make photos look good on any site and just about with any theme. 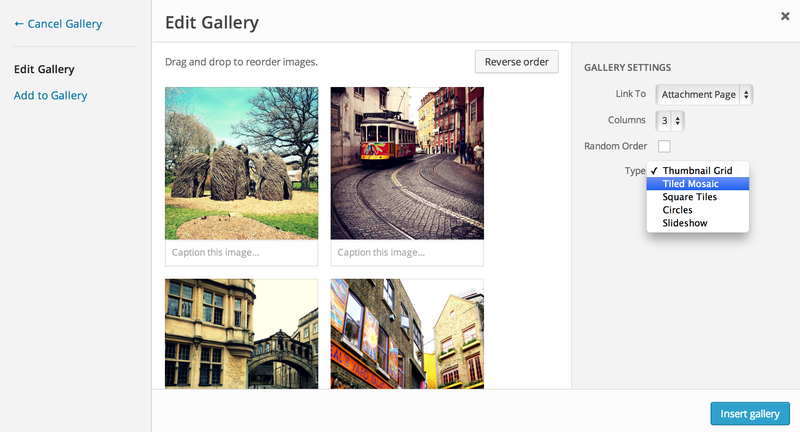 Combined with the Photo Carousel, the Gallery really makes your photo displays stand out. However, due to the way the new Reblog currently works, reblogging a post that contains multiple images has an unexpected and decidedly unwelcome side effect if copyright is a concern. Right now all the images in your post are copied and transferred to the reblogger’s Media Library, regardless of how many images are used in the actual Reblog itself. In spite of a Staff reply in the forums to the contrary, I very much hope this is a bug and will be addressed. You can read more about it and some additional complications in the comments on wpcommaven The New Reblog, Part 2-Images Gone Awry. What does the new Reblog function mean for me personally? For a short moment, I considered watermarking my images, but wholeheartedly dislike them. So the only real recourse I have is to upload fewer images at lower resolution. I want to believe that people will be honest and abide by my CC License if they choose to use my images, but also know that I tend to wear rose-colored glasses. What would you people recommend for the good theme that combines writing/travel style with putting a good gallery? There are some nice themes (both paid and free) in the photography filter in the Theme Showcase. But you don’t have to choose a photography theme to create cool galleries, which I mentioned in the post (and this recent post, too). Might want to browse some travel blogs to see some themes in action (scroll to the bottom of the blog to see the theme they’re using). Gridspace is pretty sharp (example), Spun is free elegant theme that’s great for prose and photos, and Duet is sleek theme that feels like you’re flipping through the pages of a glossy magazine — good for longform and your travel narratives + full-size images (here’s an example). These are just ideas for you to start looking — I recommend searching the Theme Showcase! I want to do a photo history of my family, but not just photos. I want to be able to tell a little bit about the photo: origin, those present, occasion or circumstances or even a short bio of one or more persons in the photo. What theme do you suggest? A theme that displays your photos but also short descriptions or accompanying text would be good, and many of our themes do this. You could consider a photography theme that showcases pictures on the front page, but also text excerpts (like Vision or Visual) but also choose a more traditional blog-style theme as well. We started a photoblogging series on The Daily Post recently, which also has suggestions on how to pick a photography/photo-focused theme. Your Media Manager also allows you to write captions and descriptions for your photos (no matter your theme), FYI. All three themes featured in this post are free themes — we encourage you to explore these and our many other beautiful free themes! Thanks Ben! I missed that part right there. Hehe… Sorry. But for sure, I am going to try to use these themes. I already saw the live demos. So awesome! I switched over to Tonal last week and love the bold clean display of photo galleries. It jst makes the post look …well…”complete”.